Roger and his team have seviced our boiler and heating systems for over eight years. They are excellent service engineers, helpful and friendly in their support when you need them. We would recommend Thermal Heating Service for all your heating and water system related issues. Big boys installations. And they also help out the little boys like us as well. I would recommend Thermal Heating Services, Roger and his son have serviced my boiler for some years now also installed my shower,so if you would like friendly reliable and hardworking people to see to your plumbing needs then look no further. 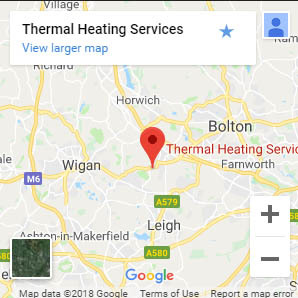 Chris Peet and his team at Thermal Heating Services are not only professional, accommodating, honest and hard working, they are nice people too! Chris project manages his team very well and is always available to give advice. I would have no hesitation in recommending Thermal Heating Services.